Today we are excited to introduce Lauren Hattinger to the Texting the Truth community! Thanks, Katie. Glad to be here. I have been blessed by your friendship ever since our college days! But, can you introduce yourself to our readers by sharing a little about your family? Of course. My family consists of my husband, Scott, and I and our two daughters. Gwen is 4.5 years and Ava is 3 years old. Paint a picture for us of what daily life has been like for you over the past few years. I live with the connective tissue condition called Ehlers Danlos Syndrome, which causes my joints to slip and pop out of place. It’s painful and, at times, completely disabling. Towards the end of my second pregnancy, though, I had symphysis pubis dysfunction and plenty of back pain. After Ava was born, I had much more back pain and trouble walking. When I couldn’t lift my legs enough to climb the stairs at home, I knew something was terribly wrong. Turns out my pelvic joints were separated and completely unstable to a degree usually only seen in high impact car accidents or falling off a horse! Oh, my! I’m sure that is not how you expected your postpartum days to look! Unexpected for sure! I ended up using a walker to get around my house for 4 months. I barely managed to feed my baby and put her down in the pack n’ play two steps away. I couldn’t care for my toddler. I sat by helplessly while she threw tantrums. I had no idea how to parent a toddler in normal circumstances, let alone while being disabled. Satan hurled doubt at me every hour of every day. I was weak and weary, confused why God would let this happen. About 3 weeks postpartum, I was trying to fall back to sleep after a night time feed. In that moment, I felt God reveal to me why my pelvis had to break apart. During labor my daughter was in distress with a tight umbilical cord, and she needed to come quickly. God chose the natural route for her – which meant I needed to break. I could accept the why, but questions about how my family would survive this season loomed and threatened my sanity. We started to accept and hire help to care for my toddler. And I started intensive physical therapy. I had to relearn how to walk. How to pivot while carrying a crying newborn back and forth across the room – baby in one arm and cane in the other. We came up with practical strategies – step stools and ladders for everything my toddler needed to get into – her chair, her bed, the car. Two years after giving birth I completed physical therapy. I no longer have to calculate the worthiness of each step before I take it. Praise God! So do you feel like God was teaching you anything during those years when life and motherhood didn’t seem to be turning out the way you planned or expected? Definitely! My natural bent is towards a type A personality in school, work, and raising children (I’m type B when it comes to housekeeping, though! 😉) Although I knew God was ultimately in control, I almost thought that with enough forethought and planning I could determine my family’s fate. I could keep us safe from harm and mold my children into obedient lovers of Christ from the beginning. Then, when I couldn’t even walk, I went from being an overachiever to little more than a source of milk for my baby. God used this circumstance to humble me and draw me to depend on him for strength. It is written in 2 Corinthians 12:9 that Christ’s strength is made perfect in weakness. But how? What does that mean when you can’t put one foot in front of the other? I still ponder this verse. At times it is uplifting and makes sense to me, and in weaker moments I am just confused and seeking an answer. Yes! You and I were just talking about that verse the other day! At times in my life, I have missed the truth that I am not God, there is only one God. And that I do not have the power to change circumstances or people. Only He can do his divine work in our lives. Accepting my humble position as servant and not as master has been an ongoing process that I wrestle with daily. I’ve lived with Ehlers Danlos my whole life, even before I knew the name for it. I always persevered to accomplish my goals. Becoming a parent stopped me in my tracks (literally, ha!). I now acknowledge that I have a physical disability. I can’t believe I said it out loud. I have to parent differently. My house functions differently. I still strive to do more than I possibly should. But I finally have come to rest in the Lord and share the burden with him. 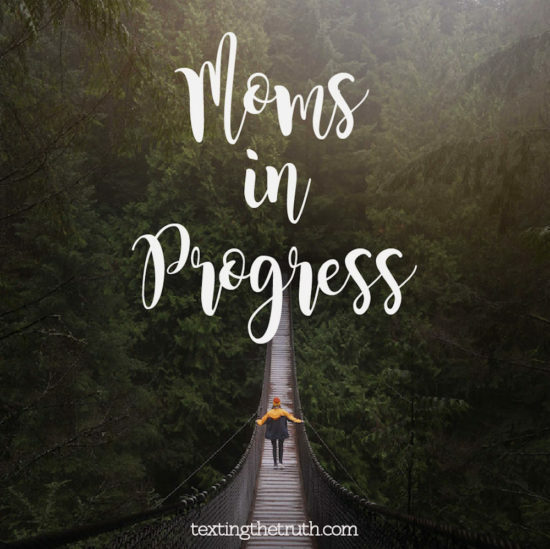 Do you have any words of encouragement for other moms who are in the trenches? You know, I have read a lot of parenting books – maybe 20 or so. You could say I’ve been obsessed with learning everything I can and putting it into practice (hello, type A). I still find all those insights from parenting authors helpful, but really letting go and trusting God with my children has been the biggest blessing of all. Put off guilt, judgement, self-loathing, and condemnation and rejoice that He has the power and love to transform your littles into who he wants them to be. As moms, we need to accept grace – really. The Lord is not sitting on your shoulder waiting to crack the whip. 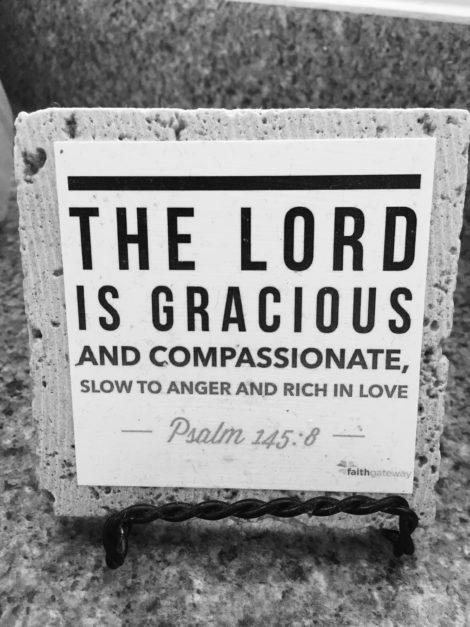 He is slow to anger and lavishing heaps of love on you. So true and words I need to really let sink into my own heart on a daily basis! Before we go here, what is a mom win that you would text to a friend? “It only took one Crazin to get my toddler into the carseat!” Even with a broken pelvis, at first, I refused to bribe my children to cooperate. But one day I realized that bribes would not ruin my children. It’s one Crazin to complete one task of getting my toddler to climb by herself into the carseat. It means in that moment, I won’t dislocate my shoulder or my hip trying to wrangle her in. And that is a WIN. Today we are excited to be featuring Lindsey Hilty. I’m so thankful for God’s providence that allowed me to meet Lindsey when we both brought our wiggly toddlers to storytime at our local library more than six years ago. And for all the ways our friendship has grown over the years! 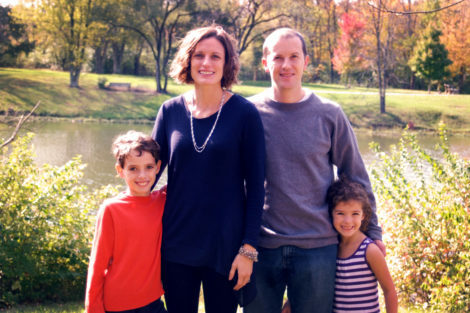 Lindsey, can you introduce yourself to our TtT community by telling readers a little bit about your family? Of course! My husband Jeremy and I have two kids, Abby, 6, and Benjamin, 8. Here is a picture of all of us together. Other than mom, I also am a full-time teacher to my son whom I homeschool. In my spare time, I freelance write marketing materials for websites, blogs, advertisements and other features for a local non-profit marketing team. What is a recent struggle you have faced in your journey of motherhood? My two children have never been easy. I would often look at nieces and nephews, or the children of friends, and wonder what I was doing wrong. When the competitive perfectionist in me starts to come out, I have to remind myself that God created my sweet children to shine for His purpose and not for my pride. My daughter has a dislike for most clothing. It’s uncomfortable. She used to wear the same outfit all week long until I pried it off her and insisted it must be washed. There were tears every morning before school. My son struggles with things we have yet to officially diagnose, but which make motor tasks, speech and handwriting range from challenging to disastrous. He and I have often lost our tempers as we battled over occupational and speech therapy exercises. In light of this struggle, what is a small victory you’ve experienced? It’s the small victories that count in our household. When my son remembers to feed his fish and brush his teeth before coming downstairs, that is worthy of a celebration, because following routines and processes can be such a challenge. I watch him and smile as he confidently puts his shoes on the correct feet. In fact, I can’t recall the last time he struggled with this once overwhelming task. I keep this in the front of my mind when I think about our current challenge to tie shoes. I tend to anxiously worry when he isn’t acting in the way I think he should act to fit in. I also fret when I think he is falling behind his peers. So, when a friend told me other children were affirming his speed as he ran through a ninja warrior course at a homeschool gym class, my anxious heart was beyond relieved and happy to know he is not only fitting in, but excelling. He is just doing it his own way. Recently on the blog, we have been talking about how to #bemomstrong by intentionally creating time for family and sibling bonding over the summer. Since I know this is a priority for you, too, can you share with us anything that you have found helps keep your family together in meaningful ways? Jeremy works second-shift as a pharmacist, so we always have to be a little creative to plan family time. We eat our biggest meal of the day at lunchtime. Lately, we have been playing games to encourage the kids to stay at the table longer, and to interact with us more. A couple favorites are “Guess what I am humming?” or “Would you rather…? I love it! I’m always looking for ideas to make meals more of a time to truly interact and connect as a family. What else have you done? I have a bad habit of over-scheduling. Today, after double booking us, my husband sat me down at the computer to create a shared calendar. I also promised to say no a bit more often, so we still have the downtime we need. He is so good about suggesting things that aren’t on my crazy calendar, like family bike rides, or quick walks to the nearby creek. We made the choice this year not to get passes to our local amusement park, although we had enjoyed them in the past. We decided our family needed some more unscheduled moments where we could just be together and make some memories. Hopefully, this will teach our kids how to find fun and entertainment in the little things. Finally, we make sure our weekends have enough time for family game night and family movie night. The kids know that Mommy shows no mercy in Monopoly, and Daddy makes an endless supply of popcorn even if you didn’t eat all your vegetables at dinner. 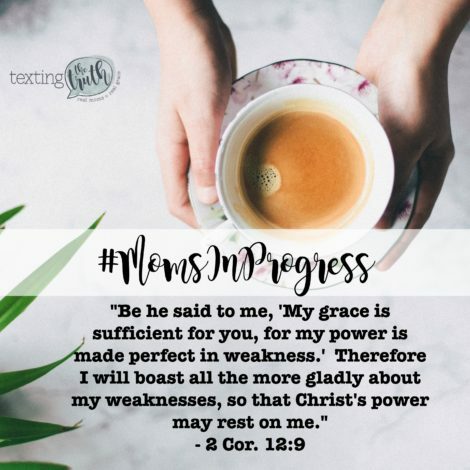 Do you have any additional words of encouragement for other moms in the trenches like you? I don’t have perfect wisdom and advice for other struggling moms, because there are so many days when I fail. For example, when my son and I were working through a book on anger, I totally lost my temper.😕 However, I am learning to mentally tick off the victories. By narrowing my focus to progress, rather than shortcomings, current struggles don’t seem quite as insurmountable. I continuously remind myself that life isn’t a competition, and my children’s successes are not to be measured by society’s standards. It’s not about the goals I think they should achieve, but about their journey as they love Jesus and hone their God given-gifts, talents, and passions. They are going places, and they will get there in their own time. In the meantime, I am going to focus on being their biggest fan. So true! Life is not a competition!🙌 Isn’t that a lesson we all need to be reminded of?! Thanks for sharing with us today, Lindsey. 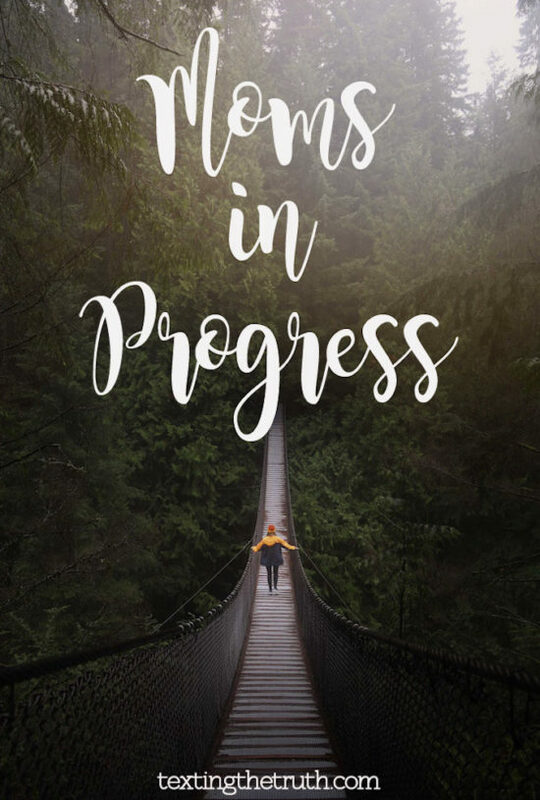 Would you like to share how you are a Mom in Progress? Click and answer a few questions about your journey.